So as I was going through my Stumble shares yesterday, and have I mentioned lately how much I am still in love with all things StumbleUpon? Anyway, I stumbled across this vintage ad from Bobcat9. This ad, from what I could find, was originally posted at Mr.Breakfast.com. Obviously, I couldn’t stop myself from making these ASAP. I immediately, without hesitation, ran into the kitchen. I searched through the freezer in a frenzy to find some bacon, whipped up some pancake batter and got to work. And I’m going to have to admit, this artery clogging treat was one of the best breakfast items I’ve had in a long time. Honestly, these things should be illegal. Mine didn’t come out quite as golden brown as I would have liked, because I was afraid of burning the bacon I had so painstakingly cooked over just the right low heat, to get just the right crispiness. But honestly, once you taste the crispy salty bacon wrapped in a delicate pancake drenched in warm maple syrup, believe me, you won’t care what color they are. Fry bacon until done over medium low heat. Remove from pan and place on paper towels. 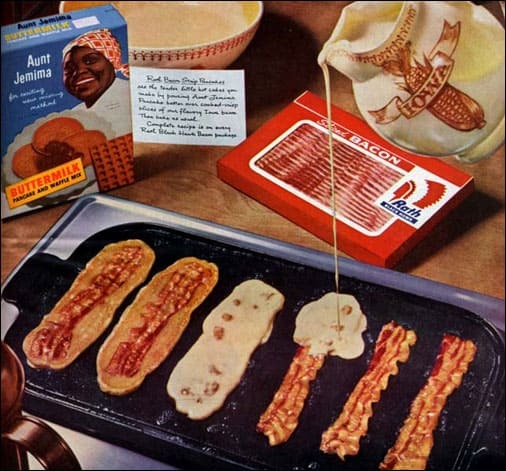 Remove most of the bacon grease from pan or griddle except for a thin layer. Return bacon to skillet or griddle. Carefully spoon pancake batter over bacon strips. Cook until golden brown on one side and flip. Cook until golden and done on the other side. Pancake batter recipe makes approximately 8 pancakes. Oh. 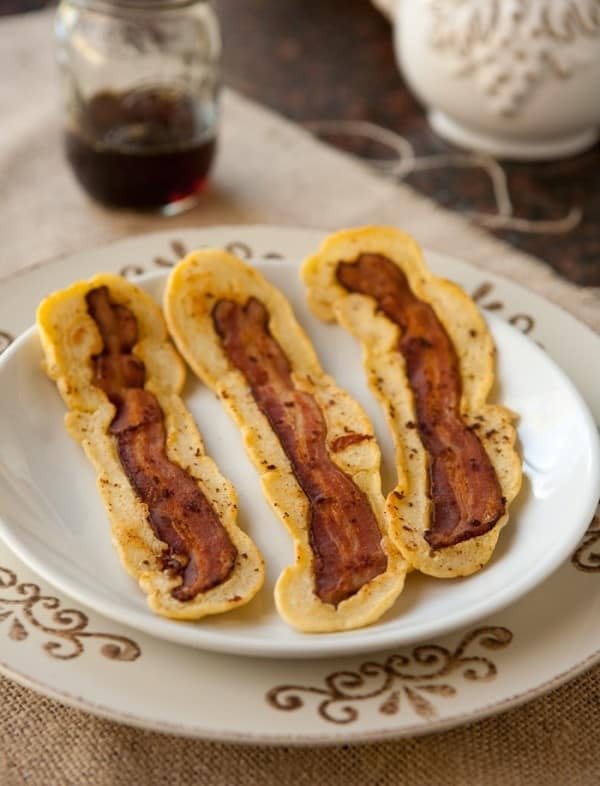 Bacon strip pancakes. ‘Nuff said. This is AWWWEEEsome! This looks so good. You can make alot of money off this recipe.. Thanks for sharing. This sounds amazing,Angie! The perfect breakfast with a cup of black coffee. Oh, Angie, this is too good to be true! My boys will love it! This looks so interesting! I’m so glad I stumbled upon YOU! Greetings from Spain and Happy Holidays! Oh my goodness, I think my family would freak over this! love it! YES. Tomorrow morning. This will happen in my house. Love the shape of these. You’re guaranteed to get bacon and pancake together in every bite. Oh, cool, they brought back old English “Bacon Froise”. What’s several hundred years old is suddenly new again. Cool! I too came across this ad on Stumble Upon! So glad you made them 🙂 They look delicious! Wow french toast with the toast removed and replaced by bacon, amazing. We’ve had these exact same pancakes at Open City in DC for a few years. Really good bacon is the key. Wow, this looks awesome. Thanks for the great idea!